Tom Crews (Class of ’68), left, chats with Paula Kerlin Searfoss (’67) and RT Searfoss (’67) during the Syracuse Alumni Association’s annual banquet on Saturday night. SYRACUSE — “We pledge our faith to the gold and blue.” That’s the final line to the school song of the the former Syracuse High School. 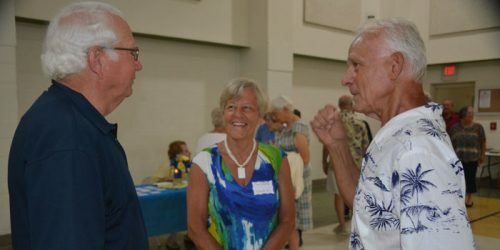 For many alumni of the now defunct school, which saw its final class of seniors walk across the stage in 1968, the words of the song are put into action each summer as they return to town from locations near and far for the Syracuse Alumni Association’s annual banquet. 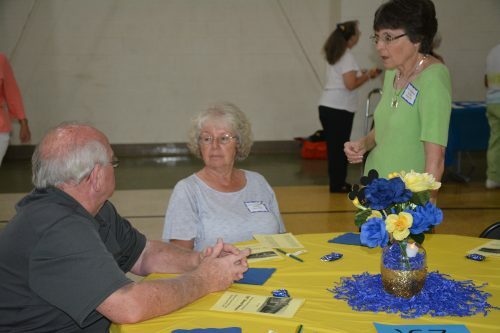 This year’s iteration of the reunion marked the 108th annual gathering of Yellow Jacket faithful, held Saturday evening at the Syracuse Community Center. This year’s honored classes included the graduates of 1937, 1947, 1957 and 1967. Emceeing the event was Joe Hibschman, who welcomed the attendees prior to a singing of the aforementioned school song, which was led by Marie (Eby) Tom. 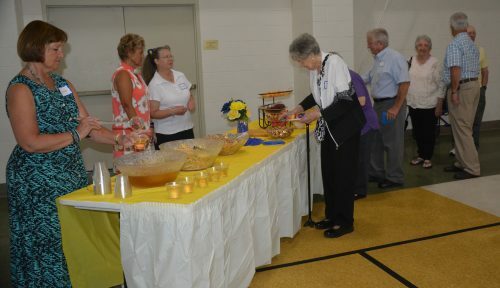 Bob Baugher offered the invocation prior to a catered dinner which included a salad, noodles and mashed potatoes, ham, baked chicken, green bean casserole and a variety of pies for dessert. 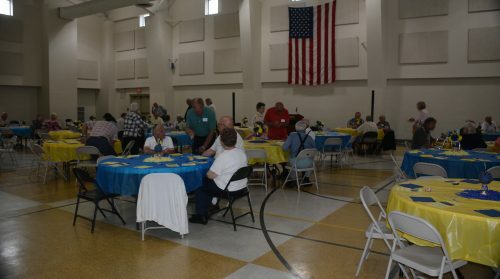 Following comments from members of the classes of 1947, 1957 and 1967, a special program titled “The Dixie Clucks” entertained the gathered alumni. Following the program, Baugher provided the benediction to conclude the evening. The Alumni Committee for the 2017 banquet included Judy Jarrett, Ann Garceau, Hibschman, Baugher, Cliff Wogoman, Roger Niles, Dennis Buhrt, Jack Zimmerman and Sandy Flanagan. Next year’s SHS Alumni Banquet will take place on Saturday, June 16, 2018, and will honor the classes of 1938, 1948, 1958 and 1968, which represented the final group of graduates from the school. 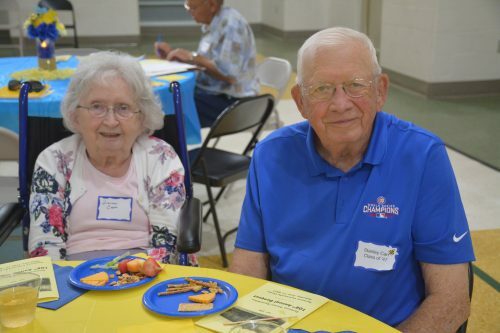 The Syracuse Community Center was festooned in Yellow Jacket blue and gold on Saturday night, honoring the alumni and spouses of Syracuse High School. Alumni of Syracuse High School were treated to appetizers during the social hour of the Syracuse Alumni Association’s 108th annual banquet. 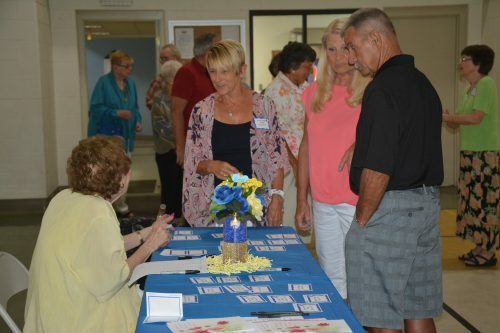 Jean (Ketering) Koher (Class of ’43) greets Diana (Smith) Winkle (’67), Pam Miller Smith (’67) and Rod Smith (’65) to the Syracuse High School reunion banquet held at the Syracuse Community Center. Stanley Carr (Class of ’47) and his bride Frances Carr pose in their seats at the 108th annual Syracuse Alumni Association banquet. Ann (Vanderford) Garceau (Class of ’64), standing, chats with Mary Jo Martin Mullins (’67) and Roy Mullins during the social hour at the Syracuse Alumni Association banquet, held Saturday, June 17.